here) so I’ve been hoarding my stash, waiting for the right moment. fragrant, and chopped up some goat cheese feta. 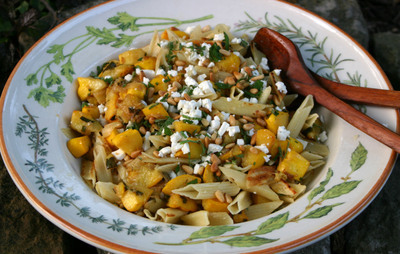 bowl, added the squash and tossed it together. Sprinkled some cheese, pine nuts and a little more mint over the top. was it – easy, easy, easy and delicious. I’ve never heard of trenne before – cool shape! And thanks for the link on where to buy them online.